When Thomas Shields Sr. observed the existing self-storage market in the Waynesboro, Va., area in 1975, he liked what he saw. There were no serious competitors. In fact, he would be the first developer of this new concept not only in Augusta County, but the surrounding region. It was a time when the “mini-warehouse” or “mini-storage” industry was in its infancy, and the public didn’t know much about this type of business. “Self-storage”, as it came to be known, had a low profile. Building construction was utilitarian at best with no frills and, more often than not, facilities were relegated to industrial-zoned land. Shields, whose primary business was construction and home-building, predicted self-storage was going to be a growing business with considerable potential. He believed that if he built new, freshly painted, sparkling-clean storage buildings and marketed the concept and priced the space properly, he would attract local residents and small businesses to his site for their storage needs. He was right. His first facility, Shields Self Storage on Bayard Avenue, was the beginning of what would become a thriving business including seven facilities and three offices, serving Waynesboro and the immediate surrounding areas. Today, the Bayard location consists of six buildings, five two-story structures and a single-story. As demand grew, the facility expanded in phases over a period of three to four years. 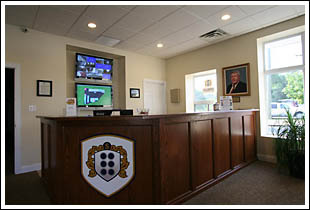 In 2008, Shields’ son Todd developed a plan and budget to rebrand the family business, update all computer and management systems, install state-of-the-art security, design and develop a new main office, and perform a renovation and other site improvements for all of the company’s locations. The ultimate goal was to continue the business’ reputation as the premier self-storage operator in the area and maintain the highly prized title of “Best Storage Facilities” bestowed annually by a local publication.